Well I finally did IT. By my own hands. I put the poor, suffering hamster to sleep. I'm not proud of it. I felt very sad. It triggered when missus frantically called me and said Hammie scratched off a piece of the growth and it was bleeding all over. Hammie had been suffering for >3 months from a large growth that had nearly covered its whole cheek (Refer to pix, see the growth in the left ear. That's about 1 month old only). It started small - like some pieces of mini flesh antennae sticking out from the ear. I thought perhaps water had gotten into the ear and I did not think much of it. But it grew... and grew... into a monstrous piece of disgusting brown tumor. The tumour sized a diameter of ~2cm (for a hamster it is actually quite big) before it's death. Ack! The growth had entirely covered its left ear, all the way down to the underside of the cheek. The whole left ear was unrecognizable and had become part of the growth. And I didn't know hamsters can have tumours until I searched the internet about hamsters having tumours protruding from the ears. And the right ear started to have these funny looking antennae too. Hammie had lost a lot of weight during this period. He used to be fat and furry, but just before his death, there were patches of fur loss, especially behind his ears. He had also shrunk in size, with skin barely covering his bones. Though he still had a good appetite (he managed to finish his bowl), he never put on any weight. Not only, he had a broken right leg for quite a while (see the right leg on pix). I don't know how it happened but I think Rachel closed the cage door on his leg while putting him back. Rachel liked to carry him around and pat him. Funny thing was Hammie actually survived and it was still actively running on his leg, er stump. His defunct leg was perpendicular to its body, attached only by the skin. Now that's my feisty little hamster. Hammie had been with the family for close to 2 years. 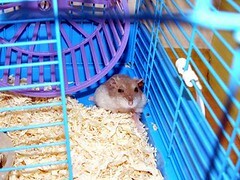 I had nurtured him since he was just a little baby hamster - washing his cage, cleaning him after his sand bath. I do take him out from the cage frequently to let him run around the house for exercise. When I stay up late at night to watch soccer (hamsters are most active at nights), I would bring him out and stroke his fur while watching the TV. He always liked me massaging his back with two fingers and tickling his underside/tummy. After a year, whenever I open his cage door and drum my fingers on the cage, he would run out into my waiting hand. He actually recognized my voice. Once he actually managed to push open the cage door and roamed the house at night. Talk about guard dog. So you can imagine the closeness I have with him. Being the ever prudent wife, missus was little concern about the vet cost of fixing the leg and/or putting Hammie to sleep. The truth is the cost is actually quite high. Approx $30 -$45 consultation fee, excluding medication/injection, whatever. She said that Hammie would not last long too. So I decided to wait for it to die a natural death. But it didn't. I actually prolonged its suffering. Rachel was still attached to Hammie. Okie, okie, I admit it. I couldn't bear to do it myself. It's quite scary to think of ways to 'dispose' the hamster. I did the clinical and swift way. I whacked it with the flat of a small stool. 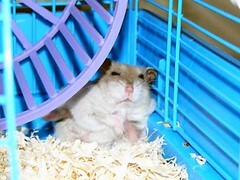 First, I put Hammie in a small plastic bag and flattened it, making sure there is little air to act as cushion. Then I put it in another plastic bag, just in case the first one might burst. I said goodbye and bham! I thought I heard it squeal a bit. Perhaps it was saying goodbye too. Perhaps it was my imagination. Following up with an additional 4 strokes, I made sure it didn't. I opened up the second bag just to check. Yeah didn't think it could live through that. I felt like crying when I threw it into the rubbish chute. I can understand the agonizing pain daily. PS. We have another baby hamster now, courtesy of missus' colleague. We named him Furrie. He's growing well and fat. It's not that I support any party, but what can one person like Chee Siok Chin (Chee Soon Juan's sister) do? I just don't understand: Is the government afraid of something? Read here (must scroll down to see picture). Do we Singaporeans really need 7 policemen/women to surround her? Aww... incredulous! Video taping too! Why? To showcase on TV and .gov websites? I wonder who is more of a moron. There is hardly any need actually! I find it so condescending and downright abusive! The truth is I could hardly believe it until I saw the picture. Isn't it close to restricting a person's rights and freedom of movement, let alone speech? Wow the ruling party just lost a big chuck of respect! Big time too. It can't get worse, can it? Interesting to discover the vast contrast on the glowing reviews on Singapore the Straits Times want Singaporeans to read about vs what the reporter (Philip Thornton) actually filed for The Independent. Read here. The Straits Times censored the latter. Unbelieveable! This must be the #1 for bitter aftertaste. I'm all for hosting world events. I'm all for caning, even capital punishments. I say again - I support caning of those rapists, vandalizing idiots, molesters, etc. I'm all for hanging because you deal in drugs. Good for you! But when you go global (eg. hosting IMF), don't expect the world to think like you do. All your efforts and investments ( I think is $135m) to organize the IMF seem to have backfired! Instead of having glowing reviews on our economic and financial stability, we were portrayed as a 'backward' developed nation. Is the government in denial? Hello? The sad truth is when I discuss politics during lunchtime with my colleagues, most of them don't have opinions (or choose not to have any). When I provide another point of view, I am sometimes told that I don't know what I am talking about and what's best for Singapore, or shrugged off, or more like a sudden quietness descends in the group and then they change topics altogether, ignoring what was said. With such a picture and high-handedness approach to politics, how does the government expect our younger generations to be open or even actively discuss their views? You know, there is this funny coldness in my heart that I can't place when I saw the picture of Miss Chee. Pity? Nah. Perhaps I am slowly losing my identity. Har, I got married on 9/11. Actually it was two years before the disastrous event in 2001. Sep 11, 1999 to be exact. I can still remember dining out with my wife and enjoying ourselves that fateful night. You know the feeling of a second-year anniversary couple. Lovey-dovey. It was until we had reached home that we heard about the Twin Towers collapse on the news. Stunned, jaws dropping. Time flies. 7 years. 7 blessed years! Can you you believe it? Just a few blogs down, I was just commenting on how Rachel had grown into a lovely 'princess'. To be truthful, getting hitched is the easy part. Getting married is slightly harder. Keeping the marriage healthy needs commitment. Having kids requires sacrifices. Plenty of sacrifices but worth every single minute. We had lots of quarrels, arguments and personal opinions. In the beginning, at least. Nowadays, it hardly matters to me anymore. We've learnt to disagree in love. Keeps the sanity, I'd say. Hear that, dear? It is no longer important who wins in an argument/quarrel. Now, it usually ends with me saying 'sorry', even if I am right. Even when she doesn't see the grey matter between my eyes and acknowledges that there is actually intelligence in it. Even when she knows she's outrightly, absolutely, without a doubt wrong. For the sake of the marriage, the family and Rachel. And sanity, peace. Even if I did win the argument (I rarely do), I cannot imagine sleeping together in our shared queen-sized bed. It's akin to sleeping with a bear having a sore head. You'll never know when it would turn around and bite your head off! I actually love her for her guts and stubborn-ness. And usually wise advice. I said usually. I remember praying for a gal who loves the Lord, one who complements the weaknesses I have and one who can mentally and spiritually challenge me. That's right, a girl who voices her opinions truthfully. You know how the Lord blesses - always in abundance. Boat-sinking, net-breaking, more than enough blessings. I got more than what I had bargained for. 7 years... wow! Do I feel itchy? ...reading the newest entries in Parking Idiots in Singapore. Unbelievable but true. Why do able-bodied drivers park in handicap lots? Don't they have any social grace or respect that these lots ARE for the handicap? I'd bet my bottom dollar that these inconsiderate morons of a driver are educated. I mean they aren't called handicap lots for nothing, right? Read the sign: FOR HANDICAPS ONLY! I will break your arm or leg if you wish to be a handicap. And gladly too. FYI, whenever I see cars without the handicap signs parking in the handicap lots, I always report them. So sue me, if you have the guts. And please don't tell me about 'elite' society if we cannot even get the basics right. Why can't people park properly? How long does it take to drive out and reverse back in again? 8 sec? 10 sec? Wind down the windscreen, look at lines, reverse. Is it so hard? I don't care what your reasons are. If you take longer than 1 min for a second/third drive out and reverse back in, perhaps you shouldn't be driving at all. Speaking about impatience. Why do people horn when you are slow to drive off at the traffic juntions? Just take 2 secs slower and you have someone letting you know his frustrations. I'm not talking about the guy behind horning at you while you are driving 80km/h on the extreme right lane of the expressway. It is supposed to be 90km/h. So if you are such a culprit, smack yourself in the head. Or I will do it myself. I've seen people queuing up for hours to buy 4Ds, Totos, etc. Worse, you see them under the hot Sat afternoon sun outside those NTUC betting outlets. Funny, I don't hear them complaining. Can someone explain to me what NTUC stands for again? It is called National Trades Union Congress. The objectives? - To help Singapore stay competitive, and workers to remain employable for life. - To enhance the social status and well-being of workers. - To build a strong, responsible and caring labour movement. So tell me, which part of NTUC delving into the other business benefit Singapore workers to remain employable for life? Or enhance their social status and well-being? And all these while I thought it is going to challenge Walmart, Carrefour or something. Got Rachel a Cinderalla princess kit from Toys R' Us. Worth every cent spent to capture this moment of her posing! "Mummy, where is my princess kit?" Here is another shot of her posing. Look how much she has grown. It had been only 3+ years when she first cried in the delivery room. Daddy was so overjoyed. Mummy too. Heh, she was glad the 9 months was finally over. Well, actually it was just the beginning. I can barely imagine or recollect how she looked like 3 years ago without referring to the photos I had taken. Wrinkled skin, clenched tiny fingers and toes, closed eyes and a small mouth that made big noises. What's a big daddy going to do with her. I was thinking, er... what's next now? Life just smacked my head and answered me. Next thing I knew, I had to change her diapers. I wondered aloud how anyone could have done it without fussing over this little thing. Yeah I took a good 15mins (don't laugh, I'm sure you wouldn't have faired better). And then I took another 10 mins to figure out how to wrap her in her blanket or 'whachacallitcloth'. Ended up quarrelling with missus, because she thought she was smarter. Yeah right. In the end, the nurse bundled her up for us. Since then, there is no turning back. She has grown from glory to glory (by the grace of God), beauty to beauty. I can only stand amazed how God has blessed her with such good looks. Not that her Daddy is handsome or has nice features. I am also in awed at the rate she is growing and changing all the time. Just the other day, I was so surprised she was speaking in complete sentences. She had also been using words like 'disgusting', 'delicious' and 'crazy'. Ok, this is Daddy's fault. He likes to use this 'crazy' word while driving. Especially on motorists who are basically... crazy. And stupid too. Mummy told her 'stupid' isn't a nice word to use and Rachel promptly reminds me each time I use that word on idiotic moronic motorists. Working too hard and spending (selling?) your life in the office for the sake of money aren't going to make the kids understand your contributions to the family. Your presence does. Make it count.